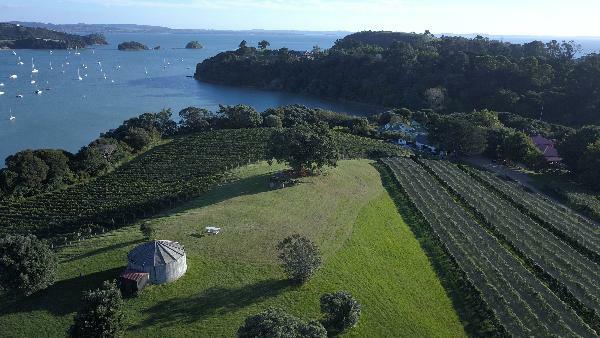 Goldie Estate is the name of our boutique vineyard nestled in the beautiful setting of Waiheke Island. Here we create character wines that draw on the knowledge of Kim and Jeanette Goldwater, who founded winegrowing on Waiheke Island and produced many iconic wines from this vineyard. Our business honours the legacy of our philanthropic founders with a culture built around integrity, respect and sustainable environmental business practices. Nestled among 30 acres of native bush and rolling vineyard overlooking Putiki Bay, the micro-climate provides an ideal terroir for winegrowing. Our Cellar Door is located in the vineyards original winery and is a portal to the knowledge of our rich history and fine wines. Enjoy a range of our premium estate wines, whilst knowledgeable and passionate staff guide you through our wine selection. Enjoy a glass of wine and some nibbles or a leisurely stroll to the top of our hill to soak in the magnificent views before you depart.